Arrival of Europeans. Live the powerful, dramatic and compelling shipwreck one wild and stormy night off the African Cape peninsula. This momentous event, with its shipwrecked crew signalled the very beginning of European colonisation there. 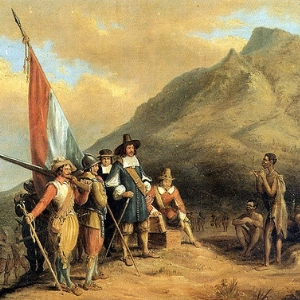 In all its parts; It is the eventful and adventure filled story of the Dutch colony at the Cape. Realistically it recounts the spellbinding tale of life there and Dutch interaction with its indigenous people. However, this was simply the first act, in an extensive drama of future momentous events.